Two Turkish pilots have been abducted in Lebanon, near Beirut’s international airport. The men working for Turkish Airlines were snatched from a bus which was carrying several other crew members and passengers between a hotel and the airport terminal. A group called Zuwwar al-Imam Rida has said it seized the men, saying they would be freed in exchange for nine Lebanese hostages in Syria. Turkey has advised its citizens in Lebanon to leave if possible. Turkey backs Syria’s Sunni rebels, and is seen to have influence over them, while much of Lebanon’s Shia community supports President Bashar al-Assad. 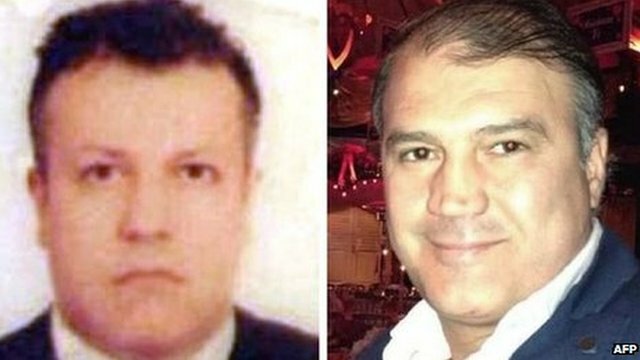 Turkish media named the kidnapped men as pilot Murat Akpinar and his co-pilot Murat Agca. Zuwwar al-Imam Rida said the kidnapping was in retaliation for the seizure of nine Lebanese Shia pilgrims in Syria in May 2012. Daniel Sheiab, the brother of one of the pilgrims, said the hostages’ relatives were not responsible for the kidnapping, but said the families “welcome the kidnapping of the two Turks as pressure which could push forward the case”. The families celebrated in the street after hearing the news of the abduction. The Turkish foreign ministry issued a statement on Friday urging its citizens to avoid non-essential travel to Lebanon. It advised those already there to leave or to take measures to ensure their personal safety. The brazen kidnapping took place just outside the airport, a few metres away from an army checkpoint. This indicates a high level of planning – especially given that the attackers knew the Turkish Airlines crew would be on board. Lebanese officials said that the abduction happened at 03:00 local time, on a bus carrying several members of a Turkish Airlines crew going from the airport to the hotel. At least four gunmen were reported to be involved in the kidnapping. Turkish President Abdullah Gul said the foreign ministry “took action as soon as possible” after the kidnapping and that he would personally speak to his Lebanese counterpart Michel Sleiman about the incident. “Lebanon is a hard and a risky place. I hope they will be rescued in full health as soon as possible,” Abdullah Gul added. There is now a heavy police presence near where the kidnapping occurred, and sections of the road have been closed. The kidnapping is the latest of a string of incidents in which the Syrian conflict has spilled over into neighboring Lebanon. More than 100,000 people have been killed in the 28-month conflict in Syria, with a further 1.7 million Syrians forced to seek shelter in neighboring countries, according to UN estimates. The nine Lebanese Shia pilgrims went missing in Aleppo province in northern Syria in May 2012 as they returned from a pilgrimage in Iran. The Northern Storm brigade, a Syrian opposition group operating near the Turkish border, said it had carried out that abduction. The group was led at the time by Ammar Dadaykhi – also known as Abu Ibrahim – who was later killed in clashes with Syrian army. Since the hostage-taking, the relatives’ families have staged frequent protests outside the offices of Turkish Airlines in Beirut. Several rounds of talks to free the pilgrims have failed, and the relatives strongly believe that Ankara can do more to influence Syria’s anti-Assad rebels to secure the pilgrims’ release.